The qualities of light: luminance, colour and… polarisation? … light reflected from glossy surfaces becomes strongly polarised at an angle parallel to the surface. Light refracted through such a surface becomes polarised in the orthogonal direction. Scattering is another optical phenomenon that may produce polarised light. That’s how I understand it, anyway. Most vertebrates perceive objects in terms of how bright they are (luminance), which wave length they reflect the most (hue) and the degree to which they do so (saturation). Some birds, reptiles, amphibians and fish seem to be able to also perceive the two aspects of polarisation (angle and degree). However, invertebrates are the ones that really know where it’s at! For example, aquatic insects use polarisation to find befitting bodies of water. 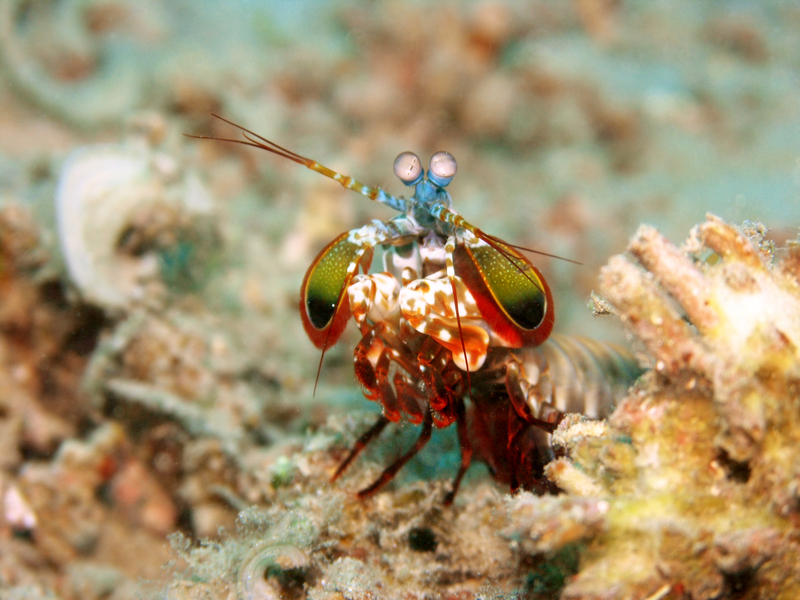 The champions of polarisation perception are mantis shrimps/stomatopods and cephalopods. The former possess “true polarisation vision” – in other words, they can discriminate elements in the environment solely on the basis of polarisation – while also displaying, along with cuttlefish and squids, polarisation patterns ON THEIR BODIES! I think it’s possible that perceiving polarisation became more and more important in those lineages as they evolved body patterning, perhaps as a means of signalling information to conspecifics (though I’m way out of my league here). How does this type of vision work? I’m sorry to say that our loyal rods and cones cannot help with that, because the visual pigment they contain can spin however it wants inside the cell. In arthropod rhabdomeric photoreceptors, on the other hand, the pigment is aligned, fixed in a certain position. Thus, it makes each receptor highly sensitive to a certain E-vector, a little bit like human cortical cells (in the visual cortex) that respond preferably to specific orientations of a stimulus. Information from the polarisation of light can be used for navigation, judging the quality of leaves, signalling, camouflaging, and enhancing the sensory input by augmenting the contrast, for example. But the most important question is: what do variations in polarisation look like???? Any ideas? Nilsson and Warrant suggest imagining it might be as difficult as it is for colour-blind people to understand how a red raspberry stands out from the green foliage when the luminance is the same. It’s probably impossible for us to fathom the appearance of polarisation, but I’d love to read what anyone thinks about it! This entry was posted in Older Findings and tagged Cephalopod, light polarisation, Sensory Ecology, stomatopod, Vision on March 27, 2013 by Ria Pi.